British and American institutions once again dominate the list of the world’s most prestigious universities, according to this release from Times Higher Education . The ranking is based on results from an invitation-only opinion survey of 10,000 top scholars around the world. The United States wins eight spots in the top 10, with the United Kingdom taking the remaining two. 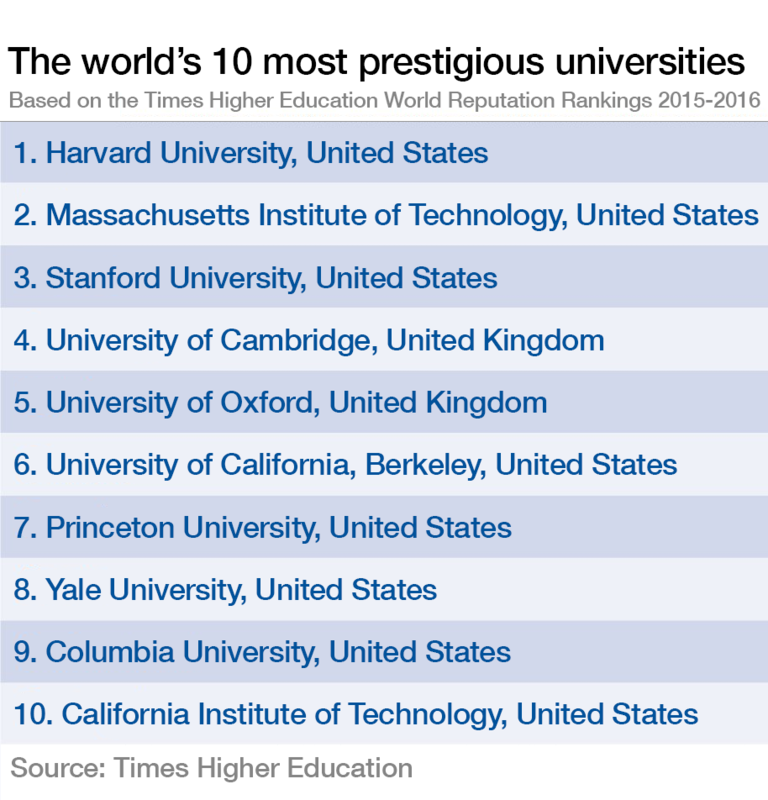 The list shows that Harvard has maintained its position at number one, while MIT and Stanford have jumped ahead of the Universities of Cambridge and Oxford since last year’s ranking. The rest of the top 10 remains largely unchanged. Over the past five years countries other than the US and UK have struggled to make it to the top 10. The University of Tokyo in Japan is the only institution to have made the cut, coming eighth in 2011 and 2012, and 9th in 2013. This year it ranked 12th. The US, home to 43 of the top 100 universities, dominates the overall rankings as well as the top 10. But Asian universities are becoming more prestigious, the survey reveals. Eighteen Asian institutions feature in the top 100 (up from 10 the previous year) and the universities are gaining recognition, with China’s Tsinghua University and Peking University jumping eight and 11 places respectively. While Asia continues to see growth in the performance and reputation of its universities, several European nations are seeing a decrease. Although the UK remains the second-most-represented nation, with 10 universities in the top 100, seven of the 10 have dropped to lower positions, while two UK institutions dropped out entirely this year. Germany has also seen a drop in four of its six universities, and four out of five universities in the Netherlands have slipped to lower positions. These are the top 10 universities in Europe Which are the world’s best young universities? How are universities adapting to globalization?